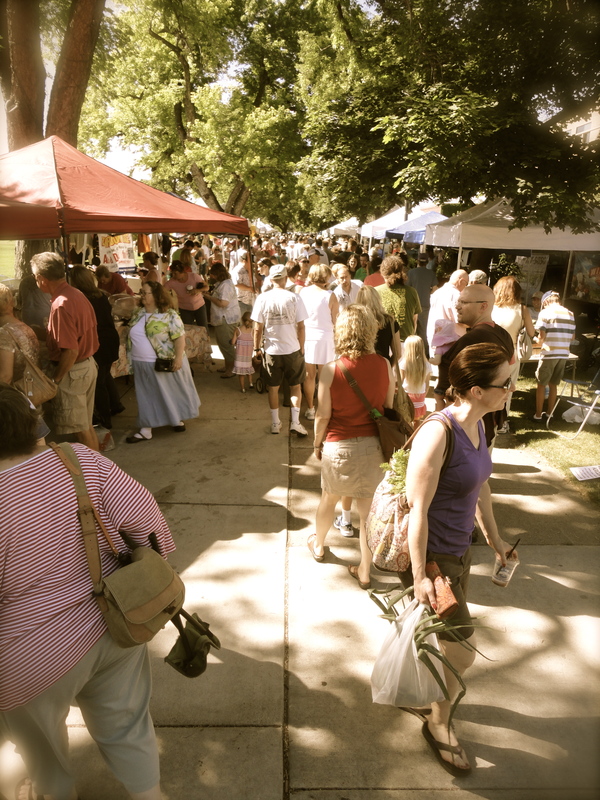 One of my favorite things to do in the summer is to go to the Ogden Farmer’s Market with my family when I go to visit. 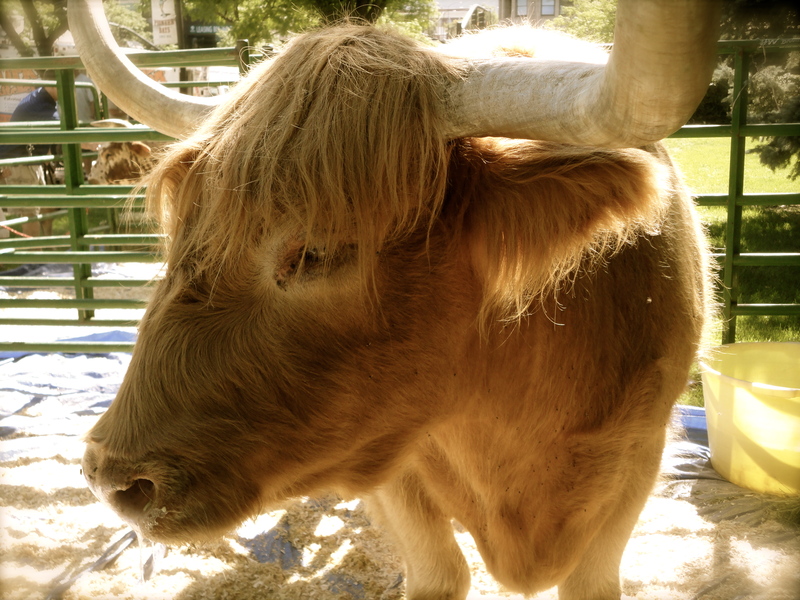 It’s one of the busiest farmer’s markets I’ve ever been to, but Ogden is an artsy place surrounded by lots of farming communities, so there’s lots of food, animals, crafts, and art. Local restaurants like to set up booths full of amazing pastries and tamales too. The whole place smells amazing. 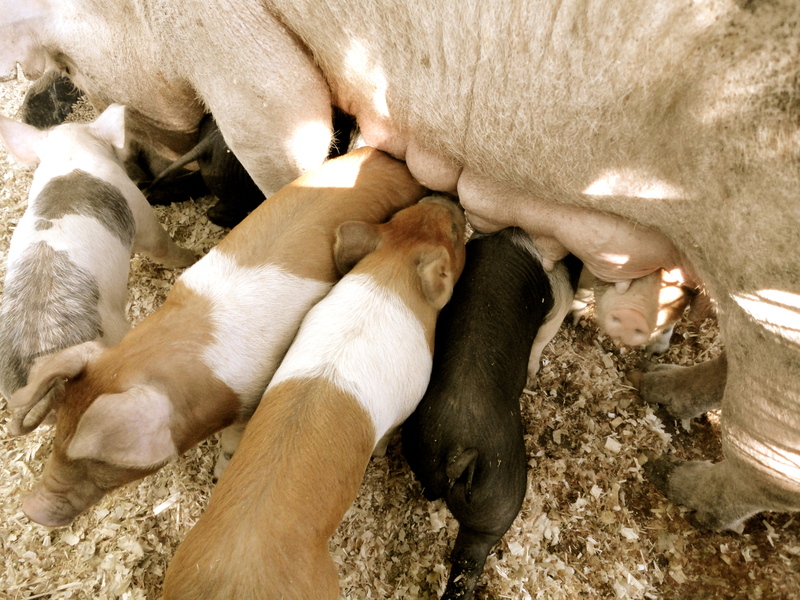 The market opened last week, so the whole place was jumpin’. I ate so many pastries. 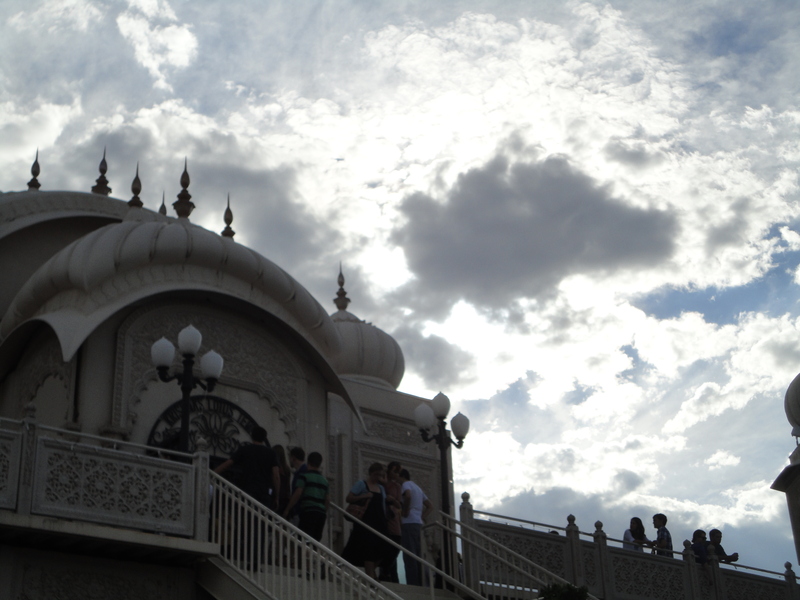 I had a good time taking photos. Half the time, I’ll go somewhere cool and forget to take pictures at all because I’m too busy looking, but I didn’t forget this time! 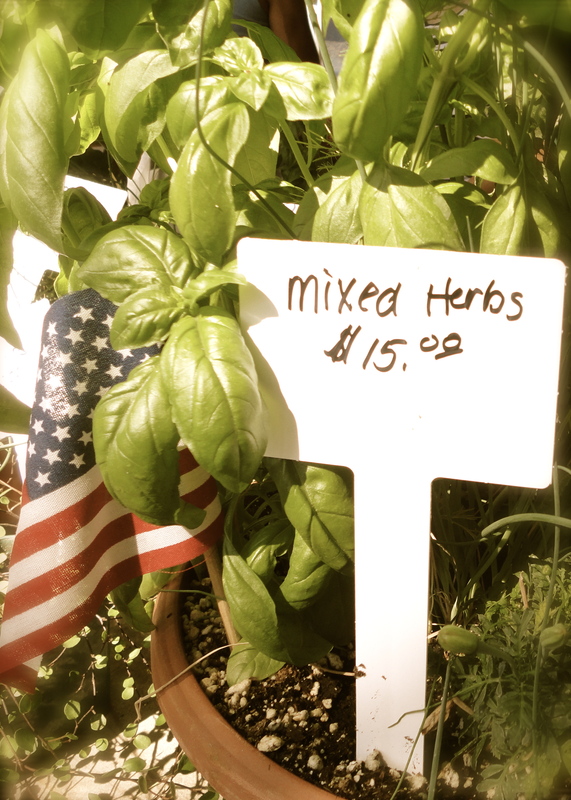 My little sister laughed at me because I walked straight up to the herb stands and immediately smelled the basil. Just bent right over and sniffed. Have you ever heard of cinnamon basil? Me neither, but it was there! I don’t even know what you’d do with that, but if you know, tell me! 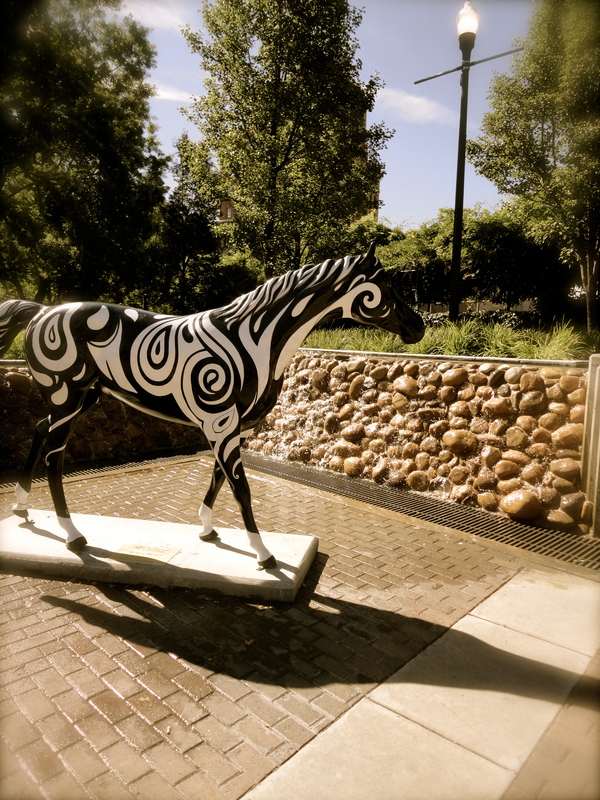 Historic 25th Street in Ogden is full of these horses painted by local artists. I hadn’t seen this one before for some reason, but it’s probably my favorite. 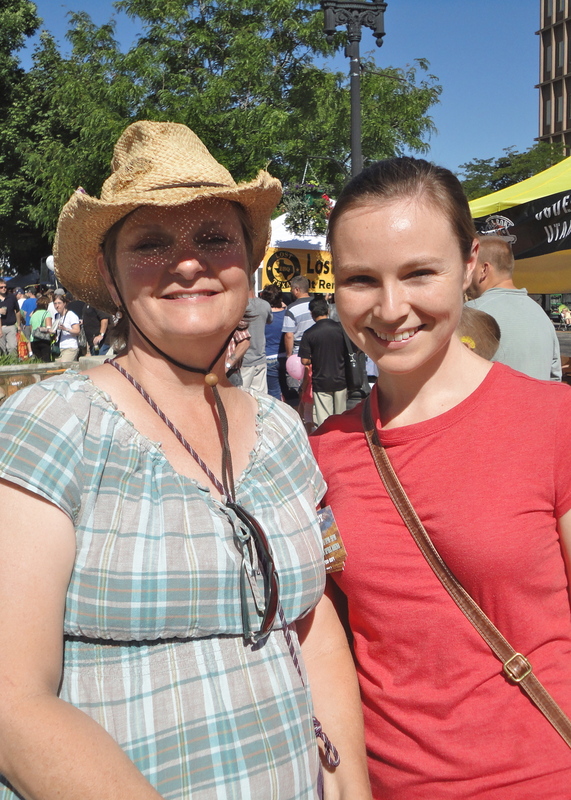 I even ran into my jr. high art teacher, Ms. Green! I was so excited to tell her I was an artist now, and she didn’t act surprised at all. I took every art class she taught and spend extra time before and after school in her room working on art. After a few hours in the sun eating pastries, sniffing basil, petting farm animals, and shopping for handmade jewelry, we cut through one of my favorite stores in Ogden: The Queen Bee. 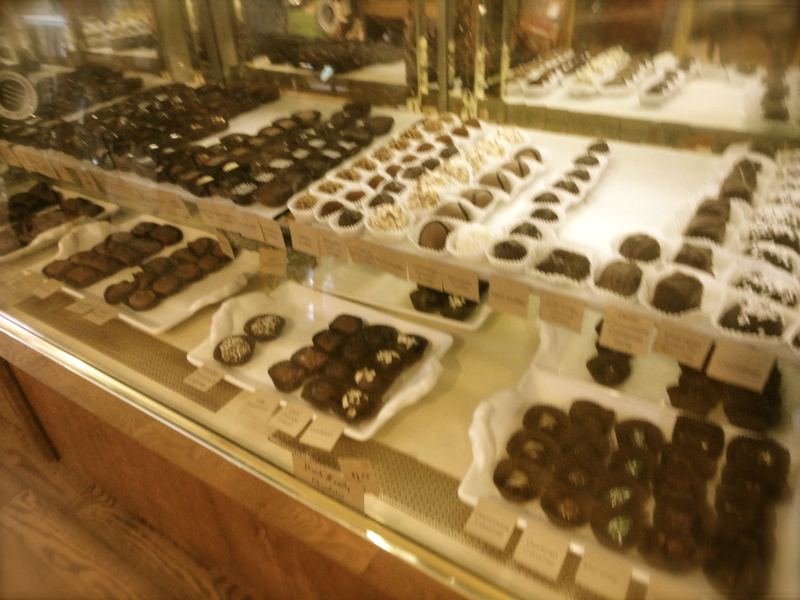 They sell games, books, art, and…fine chocolate! When I discovered this store, I thought “Oh my goodness, did someone look inside my brain and make a store just for me? !” Mom and I tried the ginger lemongrass truffle, which was amazing, and another truffle that I don’t remember the name of, but Rios was in the name. It’s a “single origin” chocolate, which means that all the cocoa beans used to make the chocolate came from the exact same place instead of from a giant mix of beans from all over the world. This let’s the unique flavor of that location really pop out. I don’t remember where this one came from, but it was the most incredible piece of chocolate I’ve ever tried, including the amazing Aztec Gold truffle I tried last time, which was my previous favorite. It tasted almost…licorice-y, by Mom says that’s not it. I loved it. I almost bought it, but I have PLENTY of art supplies, believe me. It’s a nice little reminder though. It’s something to think about every once in awhile. Maya usually loves the farmer’s markets, but this one was a little busy. All the farm animals, other dogs, heat, and explosions going off in the street for some reason really overwhelmed her, and she slept for the rest of the day. 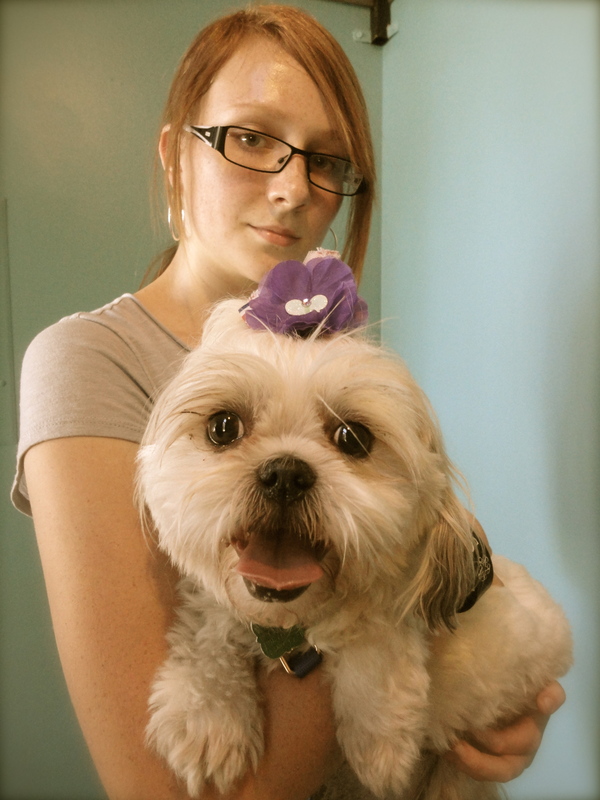 This is also my gorgeous 13-year-old sister, Erianne. I only have one sister, and I got to spend a lot of time with her that day. Also, I’m going to be off having tons of fun in Lake Powell next week, so no blog posts or Facebook updates. I have lots of cool things planned for when I get back! 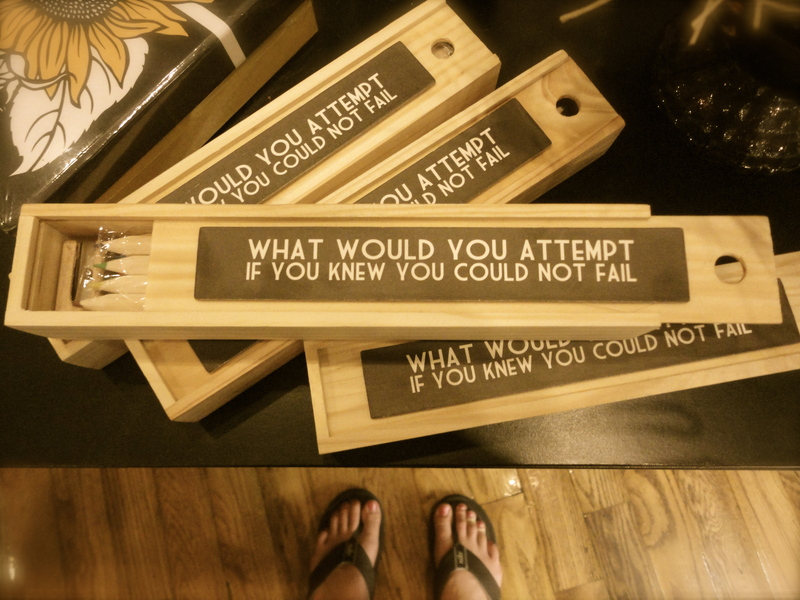 So I have to ask, what would you do if you knew you couldn’t fail? 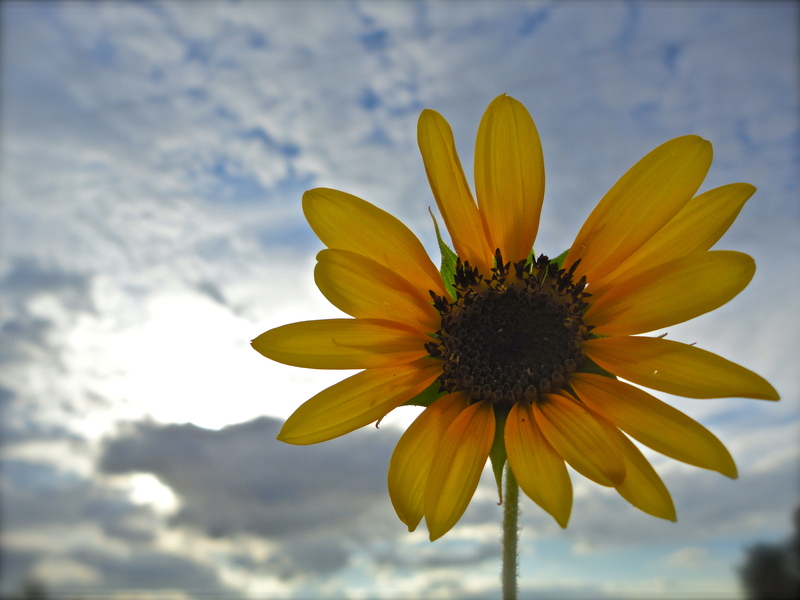 If I were a flower, I think I’d be a sunflower. They’re my favorite because they look so happy and they’re a symbol of joy and summer to me. 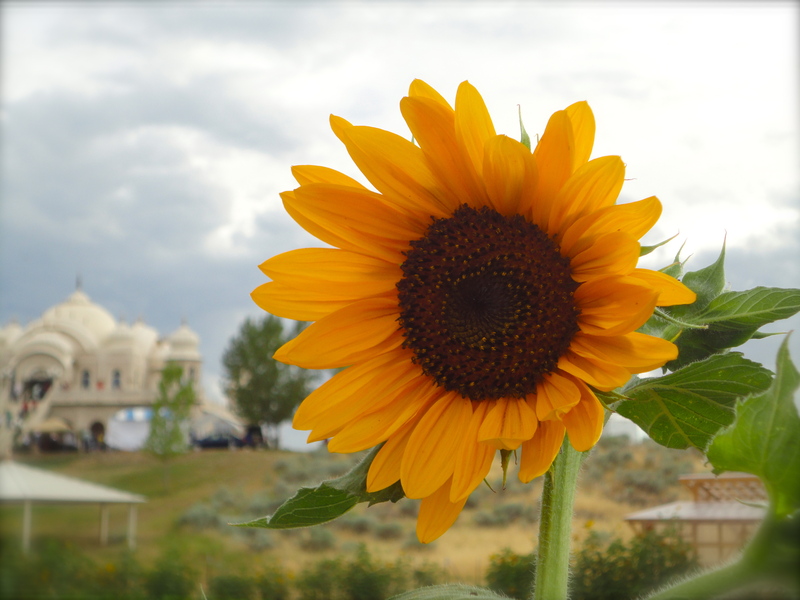 I saw a bunch of sunflowers down by the road near the Krishna Temple in Spanish Fork, Utah when I went there for the annual Llama fest this weekend. 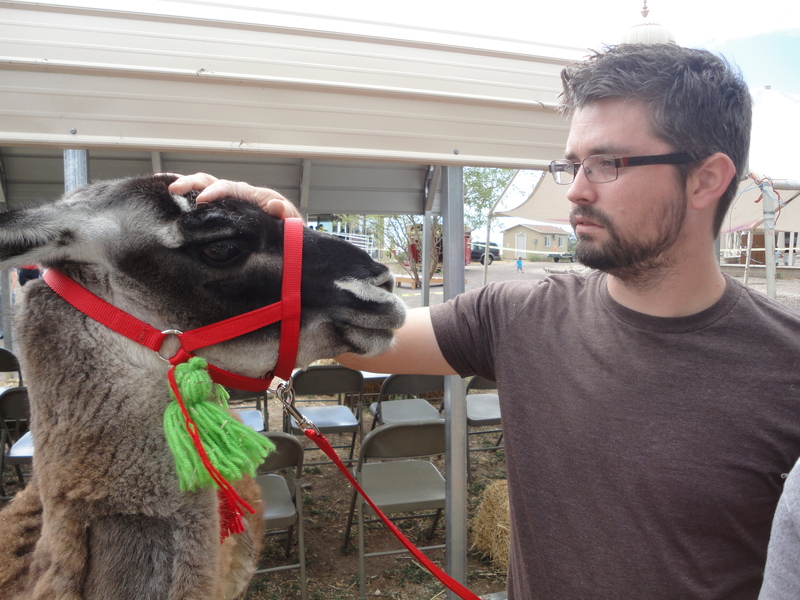 Yes, Llama fest. Lots of fun. 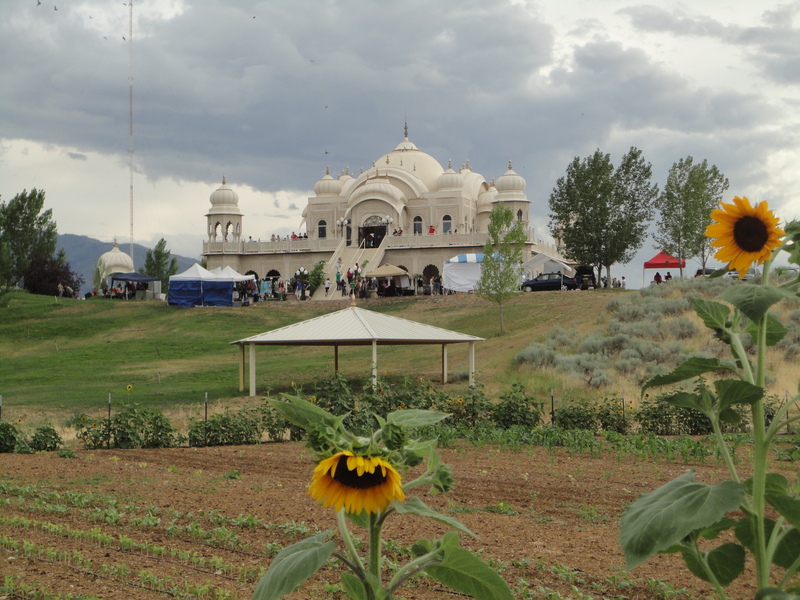 It’s like a big fancy dog show, but for llamas, and there are lots of crafts and good food, and the Krishna Temple is just a wonderful place to be because it smells like beautiful incense, everyone is happy, and it’s up on a hill with an incredible view of Utah Valley. 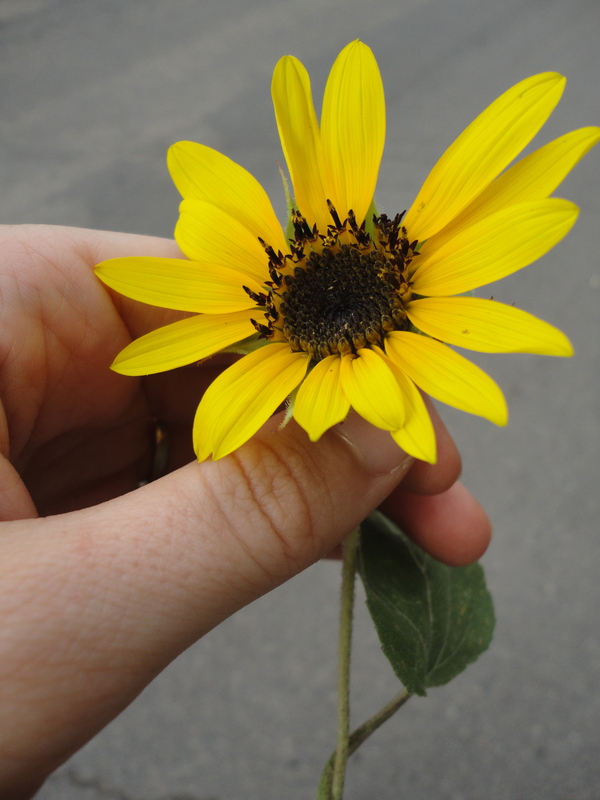 Anyways, Sam picked me a sunflower and I had a mini photoshoot. I’m planning on using these in a mixed-media painting very soon! 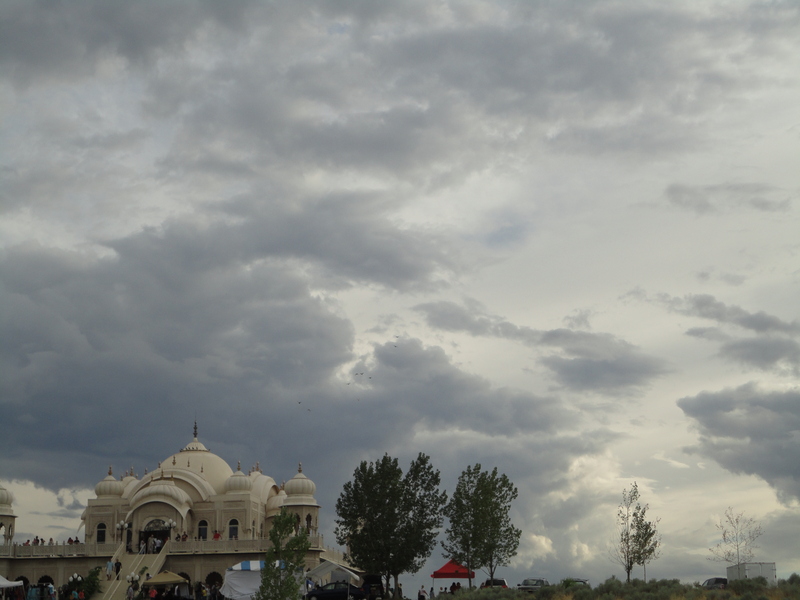 And some more pictures, just for fun. Thank you all for being such wonderful friends and readers. Have a fabulous day! So much is going on in my life right now. Sometimes I feel like I’m standing at the bottom of a mountain looking up and feeling overwhelmed by the humongous climb, or like I’m standing on the edge of a cliff looking down and feeling terrified of the leap I’m about to take. This is good though. It mean I’m growing, or at least that I have the opportunity for growth. I’m 2 pages away from filling a 300 page journal. I always feel like a big change is on it’s way when I get close to finishing a journal. My new art site is in progress, I’m preparing to apply to a big art show, I’m readjusting a lot of things in my life right now, and some other huge changes might be just around the corner. With all this going on around me, sometimes the best thing I can do it be still and feel my feet on the ground. I like to pretend I have roots and that no matter how crazy my life gets, I have stability and peace built into my soul. I can find peace in my roots. I tried something new with this piece. For awhile now, I’ve been thinking about incorporating 3-D elements into my paintings and sculpting right on the canvas. It took a few tries and tests to find the right product and technique, but I finally settled on a special non-contracting, self-drying clay for the roots. 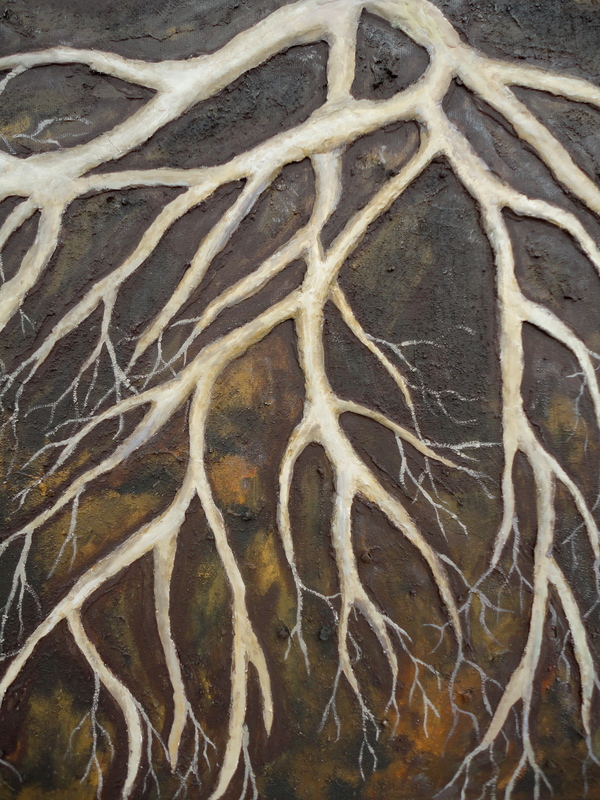 I also mixed dirt with the brown paint for the underground area around the roots. Creating this was an interesting experience. It took me around a month and at times, I wanted to throw the hole thing in the dumpster. Sometimes I didn’t like the way it looked, sometimes my back hurt from working with such a tall canvas (I don’t use an easel. I usually work on the floor or sitting with the canvas propped up), and the emotions that inspired this feeling were difficult to sit with for that long. I think this is what I needed to work through some fears and scary thoughts. I don’t think I’ll be with Etsy much longer (stay tuned on that one), so I’m not going to post this is in the shop just yet. If you are interested in purchasing it, send me a convo or email me at mckella11@yahoo.com so I can create a listing for you! So, I know I’ve been pretty absent around her for the past few weeks. A lot has happened. I’ve sold a couple of small paintings, had strep throat, met a rattlesnake on a hike, and turned 24. My domain even expired while I wasn’t looking! I haven’t been online much at all, and I’m actually ok with that. Sometimes we need to unplug. Most of the reason I’ve been gone is because I’ve been in a serious creative funk lately. I’ve started a few new paintings but I’ve run into some walls with both of them. Nothing a little modeling paste and rethinking can’t fix, but walls nonetheless. I haven’t worked on my novel much, I haven’t been very active on Etsy, and my studio is such a disaster that I can barely fit in there. I figured I could either hide behind some fluffy posts or just take a break. I chose the latter, because I knew I’d be in the mood to post again soon. So, about creative funks. I don’t like to call them “blocks” because it sounds like something outside of ourselves that’s causing us to avoid creating, but it’s really not. Nothing that has happened over the last few months could have inevitably blocked me, but a funk, now that feels more like the sticky, mucky, internal mess that this really is. I picture it as getting stuck in molasses or tar; the gunk that clogs up our creative channels if we don’t clear it out in time. That gunk will always come, but it can either get stuck or pass through fairly painlessly. In the past few months, I’ve uncovered and run into rejection, shock, the possibility of major change, shame, anxiety, guilt, regret, and all kinds of stuff that loves to gunk up our creativity like a giant hairball in a drain. This all came on fairly quickly and I didn’t really allow myself the time or means to move it out before it congealed. I avoided talking or thinking about it and instead read a bunch of (amazing) books, busied myself with household chores (my apartment is still a mess somehow), organized my ever-growing Pinterest boards so I can access my inspiration easier, and taking lots of walks. I knew that funk was there, but I wasn’t ready to deal with it. I’d let myself think about it in passing moments, tiny bites at a time because the whole elephant just seemed like too much. Real” artists aren’t exempt from this. All creators struggle to keep their systems balanced, though some may have themselves figured out more than others. So, my solution for my creative funk is to do what I can to restore the environment in which my creativity can thrive. This means different things for different people, but for me it means making space for “creative playtime”, reading inspirational things like Laura Hollick’s blog or The Artist’s Way, and making sure to connect with myself by journaling and daydreaming instead of filling every free second with other reading or Minesweeper. This morning, I’m planning to take myself shopping for art supplies with the rest of my birthday money and then having some creative playtime before I go to work. The thought of artmaking actually terrifies me at the moment, but I know that bribing myself with some new toys from the art supply store will coax me out of my shell. Whatever happens in the studio today will be ok, even if I completely ruin whatever I’m working on, make something wonderful, discover that I want to go in a completely different direction, bawl my eyes out, whatever. It’s all ok.
Mixed-Media Minis: To the Beach! After my short visit to the beach in April, I stared thinking about beach art. Most of my art is more inspired by the Utah landscape of mountains, brillant sunsets, and solitary trees, but I truly adore the beach. I’ve acquired tons of seashells and sand dollars over the years, but I’ve kept them in boxes because I’ve never been sure what to do with them. These are a little bit bigger than the other minis I’ve done; these are 3×3 instead of 2×2. I had so much fun making these! 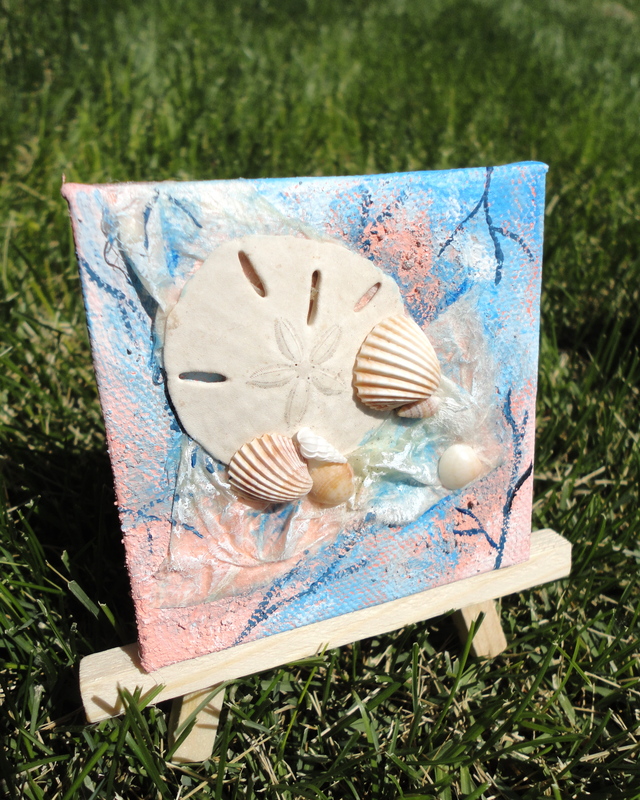 I love using natural materials like sand and shells in my art. I think I’ll play with that technique a little more. These little guys are available in the shop. 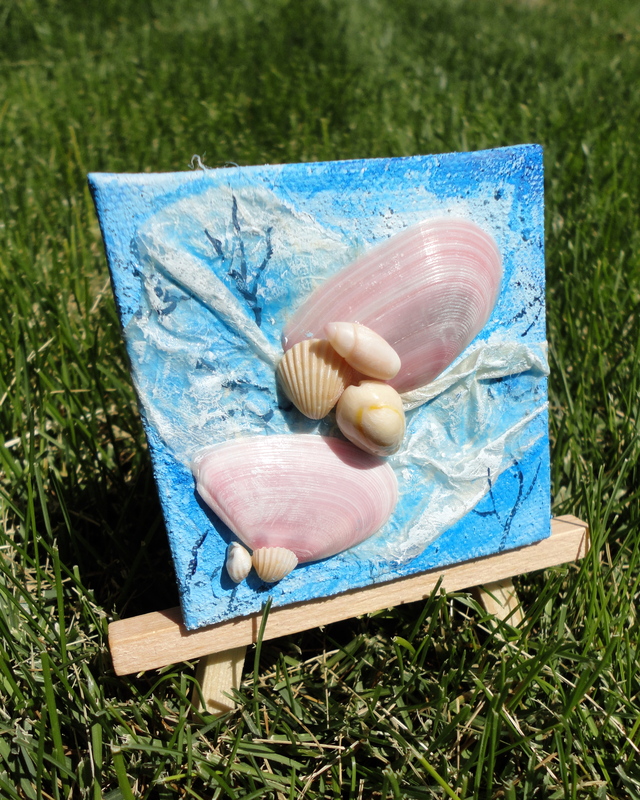 I made my mom one of these for Mother’s Day and it looks great in her beach-themed living room. They’re also perfect for office desks or small rooms that don’t have a lot of wall space for original art. It’s nice to squeeze a little art in where we can, isn’t it? Purchase here. 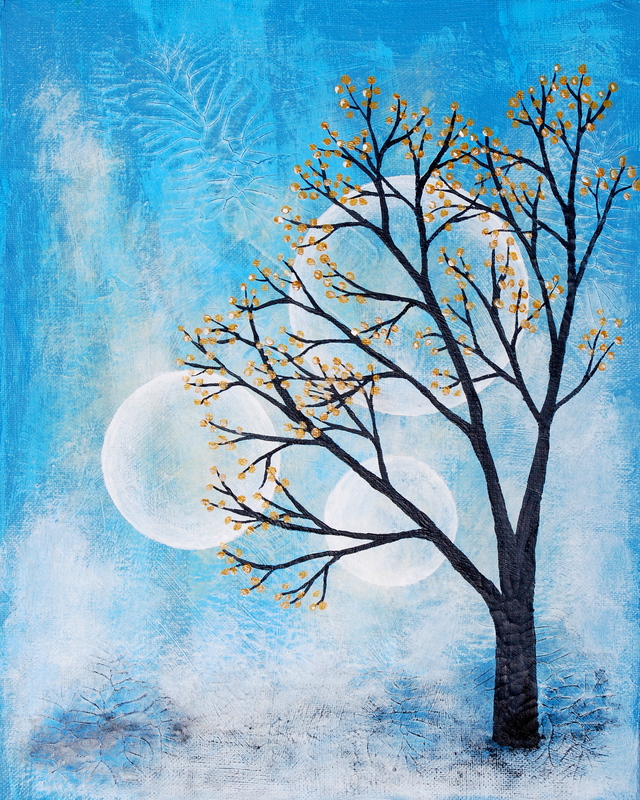 This painting features layers of crackled gesso painted icy blue and white with a black tree. I really love this one and I had a great time making it. I’m not sure what prompted me to paint something so…frosty looking, but I’m really happy with it. Purchase here. 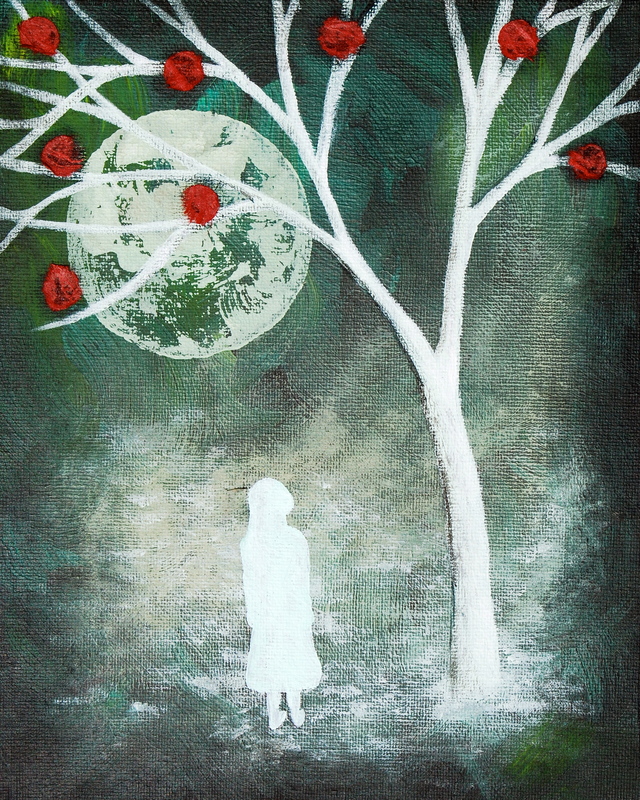 This painting features a young ghost girl standing under a white tree with collaged red orbs and a stamped moon. I love the veiny texture that comes from using thick paint on hand-carved stamps! Purchase here. In high school, I carved this linoleum block stamp of a tree, and I’ve used it quite a bit since then (like in this piece). I love combining linocut with collage and painting. 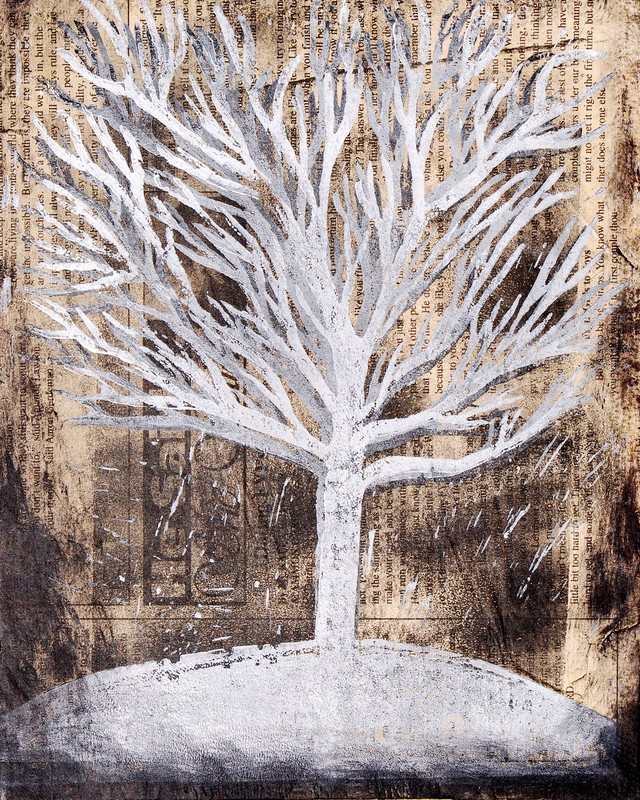 I printed the tree onto newsprint and sealed it onto a flat canvas board. I love these pieces because they’re the result of creative playtime. Have a great…what is it, Thursday? Wow. One of those weeks. Whatever it is today, have a good one! People often tell me that they’re not “the creative type”. A lot of those same people tell me how creative I am, as if it were some rare trait that only a few gifted people possess. Compliments are nice, but I’m here to tell you that creativity is not something you’re born with. There’s no “creative type”. 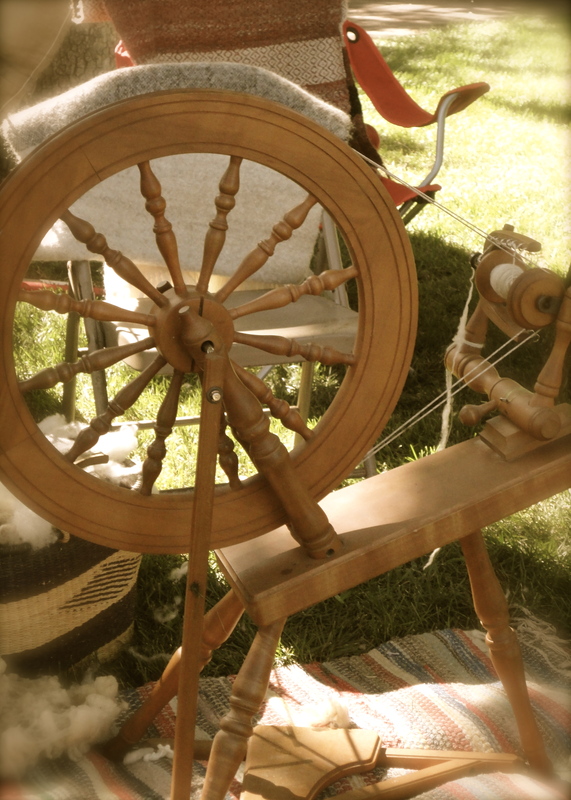 There are people who tend to gravitate towards things like art, dance, theater, writing, and basketweaving. Some people are naturally unafraid to express themselves, while others are more timid. Some people are more visual and emotional and tend to think more creatively without really trying. This really isn’t any different from people who are naturally good at math, or who think analytically, or highly useful people like my husband who can look at any broken do-dad and know how to fix it (I, however, am much better breaking things. Match made in heaven, right?). We all have a creative streak whether we use it or not. We may not all be inclined to paint or write novels, but everyone is moved by some form of creative expression, and I firmly believe that everyone can become adept at some sort of creative pursuit whether it’s writing operas or creating flower arrangements. Don’t be afraid to screw up. People who are truly in tune with their creativity aren’t afraid of making lousy stuff. If you’re too afraid of messing up, you’ll never start, and nothing will get made. Let your ideas change and evolve as you create. I was talking to my friend the other day, and he told me that he doesn’t like to make art because it never ends up looking the way he pictured it in his head. This is a common complaint. I’ll tell you a secret: I make a lot of art, and it NEVER comes out the way I’d originally imagined it, but sometimes it’s even better. Creativity is not the ability to reach into your brain and pull out your intended creation intact; it’s more about discovering as you create and allowing your work to take on a life of its own. It’s spontaneity. 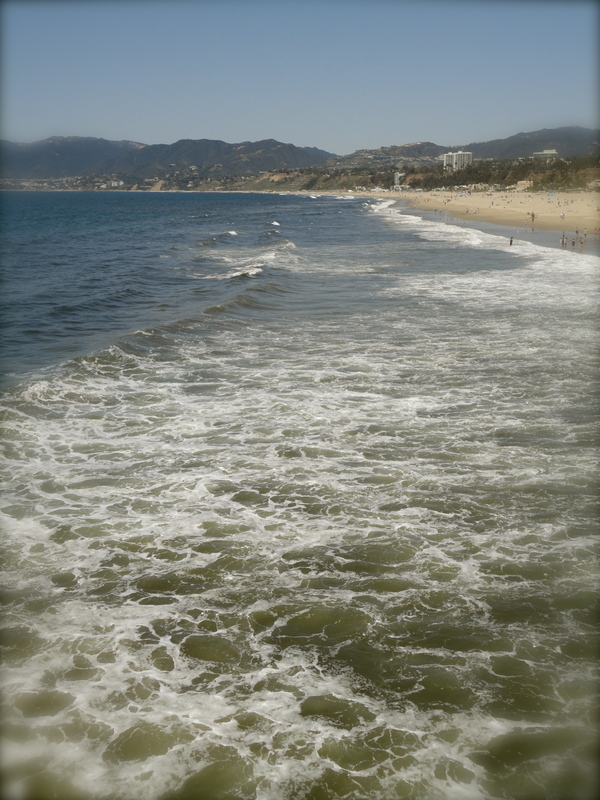 Spend some time in La-La land. Though I was a good student, I used to get in trouble for daydreaming a lot in school. I even wrote a poem about it. If you don’t let your imagination wander, you won’t get idea; and if you don’t get ideas, how will you create anything? On the same note, it’s important to let those ideas marinate for awhile before you try to make them real. Yes, some ideas just burst for fully-formed, but that usually only happens in the movies. I recently re-learned this when I got the sudden urge to start working on my novel again. I’d been stalled for month even though I still thought about the story a lot. As the words flowed out during my writing session today, I realized that I hadn’t gotten to know my characters well enough, so no wonder the story wasn’t working! After letting them run wild in my head for a little while, I found out who they were and they were able to take on lives of their own. I’ve had plenty of creative blocks before, and I’ve found that in each case I wasn’t doing at least one of these things. When I do all three, I find that my creativity flows like a fire hose. Try applying them to your own life. See what happens. So, do you consider yourself a “creative type”? Do you run into creative snags? Ok, I’m going to keep this quick because I’m in a mood that I haven’t experienced in quite awhile. This happens to me sometimes. I’ll be working on one creative project and then wake up one morning feeling like doing something completely different. This happens with my art and writing. Thought I’m both an artist and a writer, I can’t seem to do both at the same time; I’m always both feet in either one or the other. I’ve made more art in the past couple months than I have in years, but I haven’t touched the novel I’ve been working on off and on for three years. Most of my readers probably have no idea that I’ve even had that project on the back burner. Two weeks ago though, I went to bed with all kinds of art ideas and a plan for the next day’s painting session and woke up with a hankering to work on my book. That’s what I’ve been doing ever since, nearly every minute that I’m not at work. I’ve been living off watermelon and pb&j because I don’t have the patience to make anything else. Some creative people have a single, burning patient to which to devote their time. Others, like me, have more than one. Sometimes it’s possible to split their daily activities to include both, but I don’t work that way. I’ve had to learn to go where my creative urge takes me. If I feel like painting, I paint. If I feel like writing, I write. It’s kind of an unpredictable cycle and it makes it hard to set any long-term goals, like a goal date for finishing the first edit of my manuscript or introducing a new item to my shop or a new series of paintings this summer. I have to ride the waves though, because if I do anything else, the work won’t be as good. I’m a writer at the moment, but I’m still an artist too. Who knows when the winds will change again. Don’t worry, I’ve still got plenty of art in me! Trust the urge to create, no matter what that may be. I’ve wanted to be a lot of things in my life. I’m interested in a lot of things. Even though I’ve always planned on being an artist and a writer, I’ve also seriously considered going into theatrical set design, archaeology, teaching, horse breeding, nutritional counseling, and art therapy. The other day, Sam and I were sitting at an outdoor table sharing wings and mozzarella sticks, and we started talking about talents and abilities that we each had. It actually started by comparing his super-sensitive taste buds to my ears. Sam can taste things that I can’t, and I have some crazy-sensitive ears. For me, any sort of squeaky, scraping sound practically causes seizures, but I can also hear things in music that Sam can’t. He likes to play songs I’ve never heard to see if I can guess the band (if I’ve heard of the band, I can usually tell). I can’t remember the words of most songs, but I can remember obscure little beats and entire guitar solos. I hear music in a very visual way, if that makes sense. I could probably sculpt or draw the sounds. One of my favorite things to do in junior high was to listen to a song over and over and draw it. I just shrugged. I love music, but I don’t know what I’d do with it. 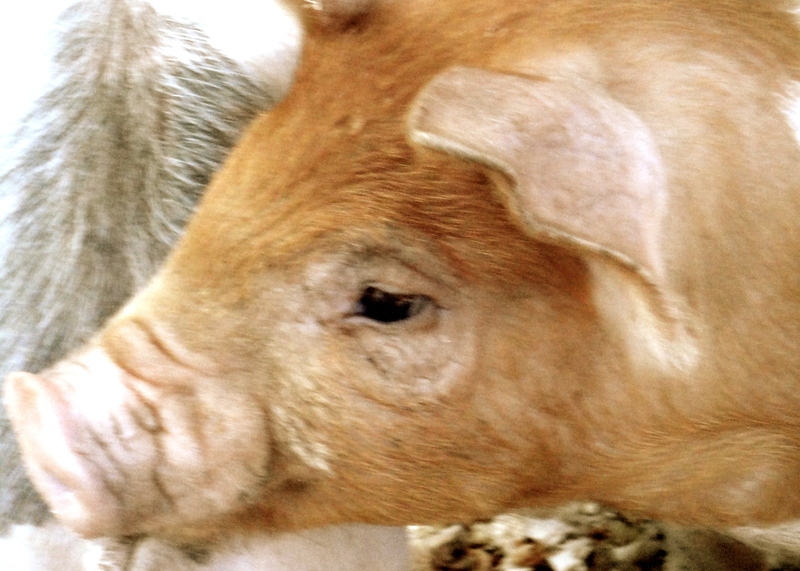 I also love animals and could happily be with them every day, but I don’t know what I’d do with that either. Sam’s kind of the same way. He’s a man of many talents and he likes to experiment, but like me, he’s has a hard time settling on one career. He’s also dabbled in set design and engineering, but he’s also a web designer and he’s going to school for 3-D animation. He’s draws and he loves film, and he loves creating props for haunted houses. Someday he might open a creature shop and make puppetry-assisted animatronics for haunted houses and movies. It’s hard to juggle so many interests. One things that I love about art and writing though, is that I can use them to cover all my other interests. 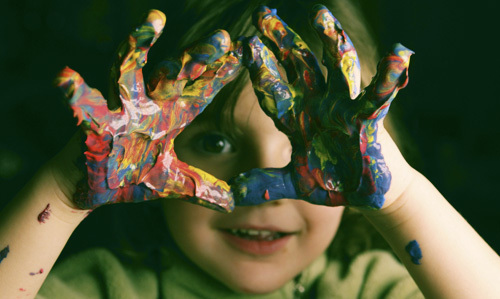 I can write about anything, paint anything, learn about anything and let it show up in my creative. Everything I do, see, love, and dream about feeds my art and writing. Even though I’ve checked out plenty of different paths, I don’t feel like I’m missing out on anything. 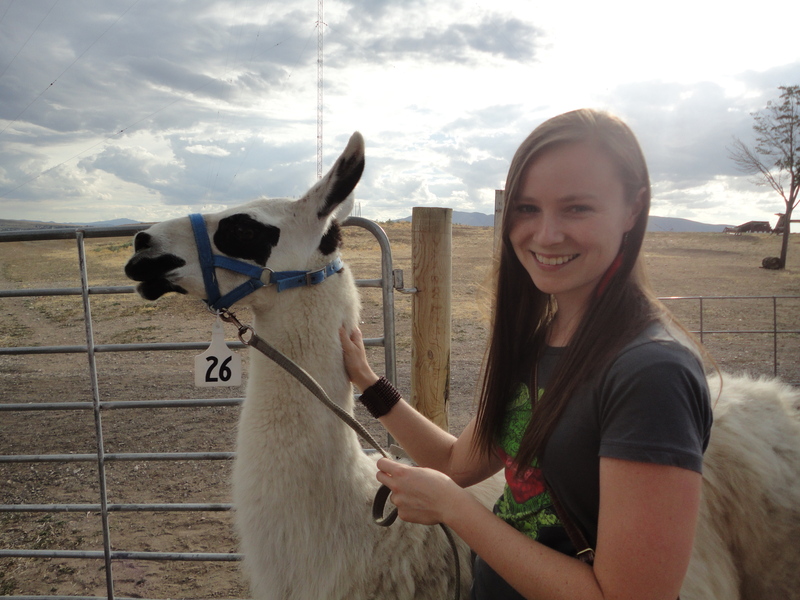 Though someday I’d love to go back to music lessons, I’d love to spend more time with animals, and I still think there’s plenty to be explored in my other interests. Those interests are there for a reason. I used to get frustrated that there’s only one of me and that I couldn’t do everything I want to do, but it doesn’t bother me much anymore. I watch Sam juggle his different interests and ambitions, and I noticed that he doesn’t stress out about it. He doesn’t seem to worry that there isn’t enough time or that he’s doing the wrong thing. He just has a good time with it. I guess that’s the best thing to do when you feel like your choices and passions are overwhelming. Just have fun with it. Let it feed you.